Remember the unvarnished dining table that I told you about here? The one with kuya in booty tooch? If you forgot na, here are the photos. I kinda felt sad that R came home last Saturday without them; that we ate again buffet style. Then we went to Bataan for the annual summer outing of his family, my in-laws. I will tell you all the juiciest details on a separate post, soon. Kapag medyo kalmado na ako, na-stress ang reyna doon, muthers. Hint: Fajardo's Beach Resort in Bagac, Bataan. Epic fail. So when we were there, he was in contact na pala with the furniture -maker and some of his men to help him deliver it to our place. We went home from Bataan with a slightly heavy heart because of some unwanted incidents in the beach resort. But still, R and I were both excited for our pasalubong for the house. It was supposed to be Tanguile nga 'di ba, but the furniture-maker opted to use a better kind of wood the hubster forgot to ask what was. 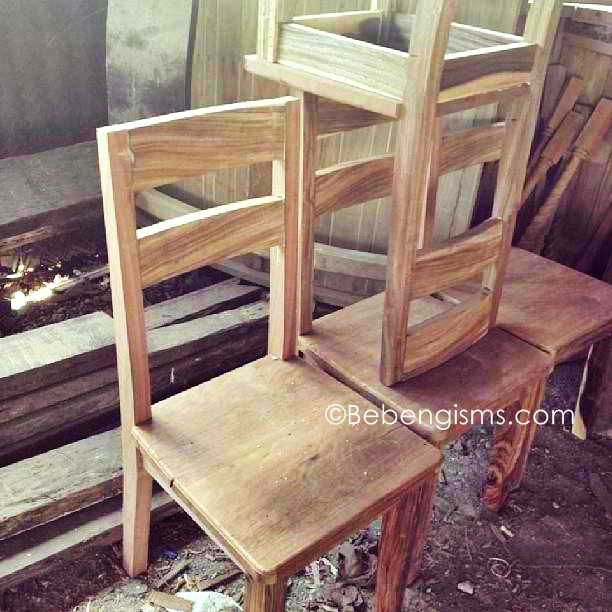 Some of the workers daw said it's "century wood", the one that are used for "antique" furniture daw. Medyo naguluhan ako dun. Ginagawa ba ang pagiging antique? 'Di ba anything old is considered antique? Laboness. So I Googled what could "century wood" be. Oak daw. Well, I will still make kulit R to ask them what kind of wood ang ginamit sa dining table ko. Of course, dapat malaman ko ang kanyang pinagmulan. Dahil hahanapin ko ang tunay niyang mga magulang. Charot. So, ayan nga we have na our bulky but beautiful dining table. To be honest, hindi siya bagay sa apartment. It's meant for a big house! In short, sumikip ang balur. Hehe. I just want to thank you, my dear Rhambo, for giving me more than what I really wanted. I asked for a nice table where we could eat our meals at; something we could buy at a mall, made from the same material like that of my blogging table. 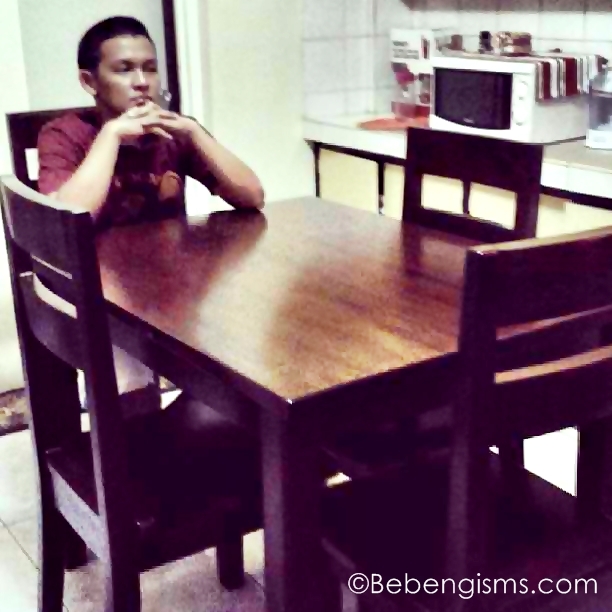 But you gave me this custom-made, solid wood though unknown, bonggang dining table. The chairs are bigger than the standard size, it was more like a throne - fit for us, royalties. Char. But yeah, that's why I wanted you to be the first to sit on it, the king of our kingdom. I'm sure I will always prepare a feast for you when you're home. Say, a King Sue breakfast this weekend, my bacon monster? After all, King Sue's tag line is "a feast fit for a king". Pak na pak. It surprisingly arrived yesterday. 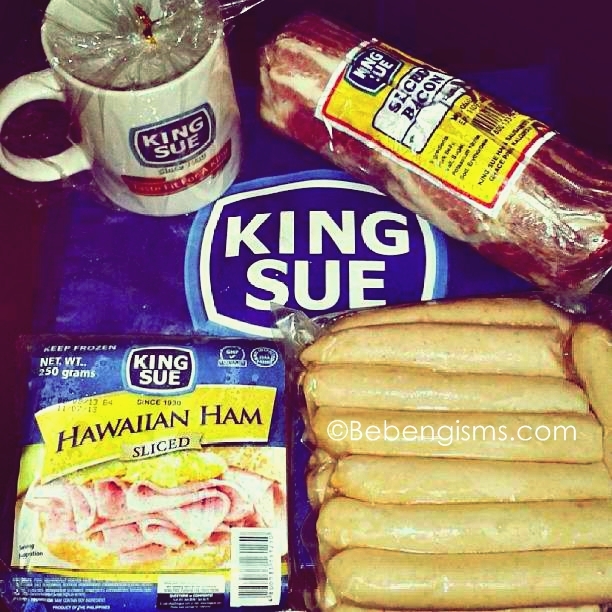 King Sue Ham's post-Mother's Day gift for me. Yum. We're blessed with the kind of husbands that we have. Pak. BTW, new reader ako. Found your link from Mommy Fleur's blog and I'm having so much fun back reading your entries. hi denise! kumusta ang 'customized' chair pads mo? gawa na? i like and love it ! !